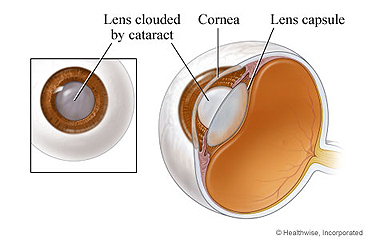 Cataracts are cloudy areas in the lens of your eye. Your lens is behind the coloured part of your eye (iris). Its job is to focus light onto the back of your eye. In some people, cataracts prevent light from reaching the back of the eye. This can cause vision problems. Cataract surgery helps you see better. It replaces your natural lens, which has become cloudy, with a clear artificial one. Phacoemulsification (say "fack-oh-ee-mul-suh-fuh-KAY-shun") is the most common type. The doctor makes a small cut in your eye. This cut is called an incision. The doctor uses a special ultrasound tool to break your cloudy lens apart. Sometimes a laser is used too. Then he or she removes the small pieces of the lens through the incision. In most cases, the doctor then inserts an artificial lens through the incision. Most people do not need stitches, because the incision is so small. If the doctor is not able to put in an artificial lens, you can wear a contact lens or thick glasses in place of your natural lens. Extracapsular extraction is a less common type of cataract surgery. The doctor makes a larger incision to remove the whole lens at once. After the doctor removes the lens, he or she stitches up the incision. Recovery from this type of surgery takes longer. Before either surgery, the doctor puts numbing drops in your eye. Some doctors use a shot instead. You may also get medicine to make you feel relaxed. You probably will not feel much pain. The surgery takes about 20 to 40 minutes. After surgery, you may have a bandage or shield on your eye. You will probably go home from surgery after 1 hour in the recovery room. Most people see better in 1 to 3 days. You may be able to go back to work or your normal routine in a few days. It could take 3 to 10 weeks for your eye to completely heal. After your eye heals, you may still need to wear glasses, especially for reading. The surgery will take about 20 to 40 minutes. You may have a bandage or patch over your eye. You may also have a clear shield over your eye. This prevents you from rubbing it. Enter K474 in the search box to learn more about "Cataract Surgery: Before Your Surgery".